Heat the butter in a large pan. Let it melt, then add the shallots, thyme, salt, and pepper. Cook for about 6-8 minutes, stirring frequently, until the shallot is soft and starting to get some golden color. Add the flour and cook for another couple of minutes, stirring constantly. Gradually add the water, keep stirring. Bring the mixture to a boil, then add the corn kernels and potatoes. Bring the chowder to a simmer, then reduce the heat to medium-low and simmer for about 15 minutes, or until potatoes are tender. Transfer a little less than 2 cups of the chowder and the basil leaves to a blender and puree until smooth. Stir the puree back into the pan. Add the half-and-half then return the chowder to a simmer. Season to taste with salt, pepper, and mix in the sugar. Delicious chowder, creamy, luscious, even if I took a few shortcuts with the recipe. Full disclosure: Casey did not use frozen corn. I am sure it would be even better with fresh corn and getting all that juicy corn milk, but I had to simplify the preparation to accommodate my schedule. Now, back to the fascinating topic of accents. As any immigrant, I am often reminded that I have an accent. I don’t mind it that much, but I certainly wish I didn’t get in other types of trouble. Casey, I hope you had a blast with your assignment too! The chowder looks so warm and comforting! Hope you try it! 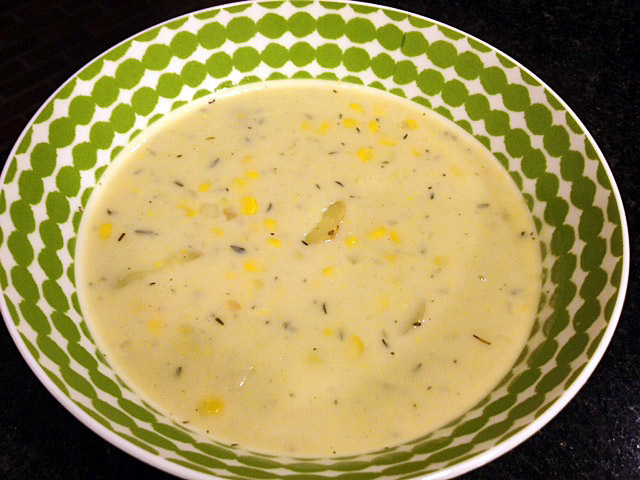 Make sure to stop by Casey’s blog, she included bacon, which I omitted, I’m just crazy like that sometimes…..
Love corn chowder what a great choice for this months Secret Recipe Club! Not bad for the beginning of the Fall… I did not think about it when I picked the recipe, but… worked well! I have been thinking of making corn chowder for a long time. I will try this soon. Jenni, if I had a dollar for every time I get in trouble with the English language, I’d be rich! hehe “chowda”!! Love it! It looks so rich and creamy! chowda is pretty funny, I cannot take credit, it goes all to Casey! Hubby loved it too, and said that for him, chowder can be good any time of the year, even the height of the Summer. So be it! Thanks, Amy! I might do that next month, which will mark my first year with the group… fun year! “Sally, darling, you are looking for the dolly, not the doily“. I love chowah … seafood or clam are my favourites though I have 4 cups of fresh kernel corn I cut off the cob myself and froze away. I COULD use that. 🙂 Is that fresh or dried thyme? I left my sweet and thai basil plants outside and the frost hit them. But I DID saved the thyme. I was going to use it in jamaican beef patties but I think it would be great in this. Fall … perfect time to start making big pots of hot soup. The proper spelling, pronunciation and everything. Plus, a great recipe to boot! Glad you noticed, Greg. As a native Portuguese speaker, it all didn’t come easy, but I got there…. It’s starting to get cold in Toronto…I could definitely go for a bowl of this right now 🙂 Great SRC pick! Yes, I totally wish I had an accent! Do you think eating ‘chowda’ will help me out there? This sounds delicious either way! Corn Chowder is just the perfect soup to have. Such a great pick on your part for this month’s SRC assignment….YUM!!! 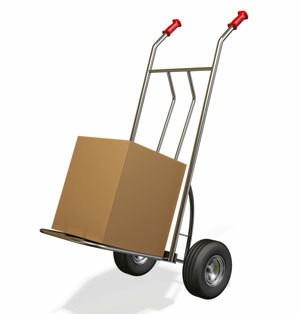 Plus, it is not that complicated to make, it comes together rather quickly. Ah wonderful! Corn chowder sounds so very satisfying right now! We’re finally dipping into cooler temperatures. Thank you for sharing. This looks delicious. Thanks for stopping by, Monet! It was a delicious chowda indeed, keep that one in mind. 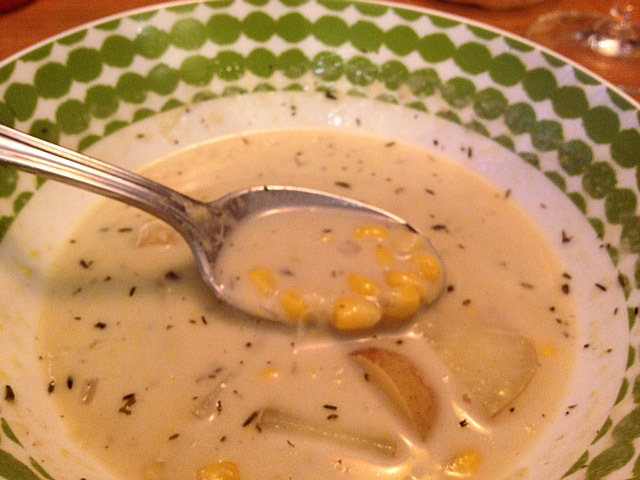 Love corn chowder! Great SRC choice! Today is raining here, and quite cold… I am miserable…. We New Englandahs do love us some chowdah — great SRC pick! You say chowdah, I say chowda… but we can still be friends! I love the name of Casey’s blog! I’ll have to go and investigate more closely… I am always up for a delicious corn chowda (!!) :). My family would love this one too – we tend to have chowders on the road (mostly Maine… yummy clam chowder) but I should try this one at home! Thanks Sally. The only thing that makes me hesitate about this recipe is the sugar added at the end. I don’t want to eat a ‘sweet’ soup. Why do you add sugar to the soup and how sweet is it? Can you leave it out? I love corn chowder! I’m going to try this recipe out it looks so good! Chowder is such a classic recipe, so many variations too! It was definitely chowda growing up in Maine and dare I say it was “con chowda” at that! Looks great. Con chowda! I learn so much through blogging, my accent is getting a nice workout! Can you believe I never made my own chowder? I think it’s about time I try it in my own kitchen. Sounds delicious Sally! 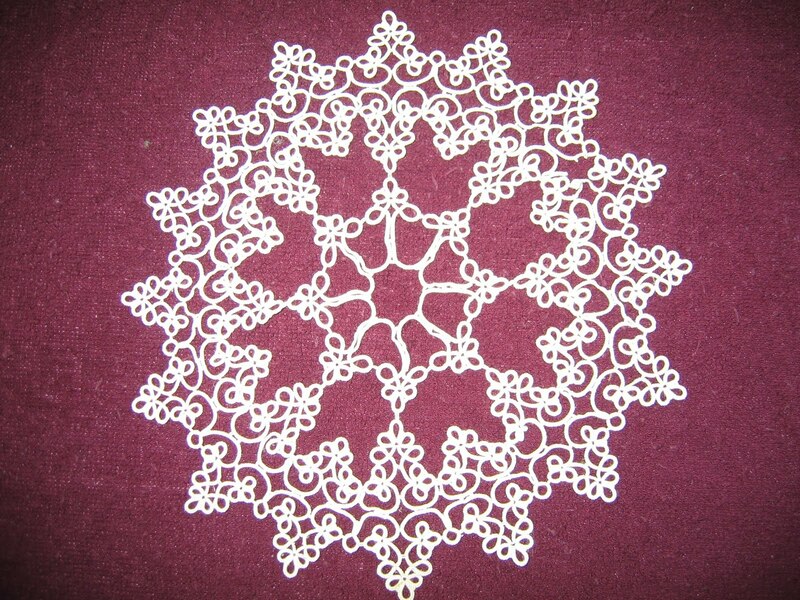 I am rather fond of doilies, but they are not very fashionable these days, we must make more of an effiort I think Sally, she drawled in her English accent. Lawks, what a lovely bowl of soup you’ve whisked up there Ma’am!